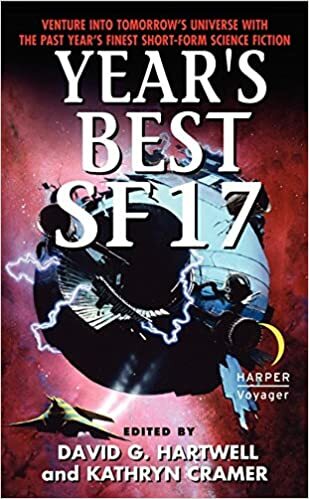 The Year’s Best SF 17 is a showcase of the best short form science fiction of 2011, selected by World Fantasy Award winners David Hartwell and Kathryn Cramer, two of the most respected editors in the field of speculative fiction. Like the previous sixteen volumes of the series that has been called “the finest modern science fiction writing,” The Year’s Best SF 17 features stories from some of the brightest lights in sf—including Gregory Benford (Beyond Human), Nancy Kress (Beggars in Spain), James Morrow (The Philosopher’s Apprentice), Michael Swanwick (The Dragons of Babel) and Neil Gaiman (American Gods) —as well as electrifying short stories from exciting newcomers. crowd toward her. “I’m so glad we found you,” she said when she drew close. “Maya was here a little while ago, looking for you.” “Where is she now?” Thorn asked, scanning the crowd. “She left again.” “Good,” Thorn said. “Thorn, she was frantic. She was afraid you’d get separated.” “We are separated,” Thorn said implacably. “She can do what she wants. I’m on my own now. Where are you going, Clarity?” Bick had come up, carrying their ticket cards. Thorn caught her hand to look at the tickets.